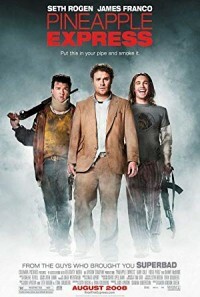 Lazy court-process clerk and stoner Dale Denton has only one reason to visit his equally lazy dealer Saul Silver: to purchase weed, specifically, a rare new strain called Pineapple Express. But when Dale becomes the only witness to a murder by a crooked cop and the city's most dangerous drug lord, he panics and dumps his roach of Pineapple Express at the scene. Dale now has another reason to visit Saul: to find out if the weed is so rare that it can be traced back to him--and it is. As Dale and Saul run for their lives, they quickly discover that they're not suffering from weed-fueled paranoia: incredibly, the bad guys really are hot on their trail and trying to figure out the fastest way to kill them both. All aboard the Pineapple Express.